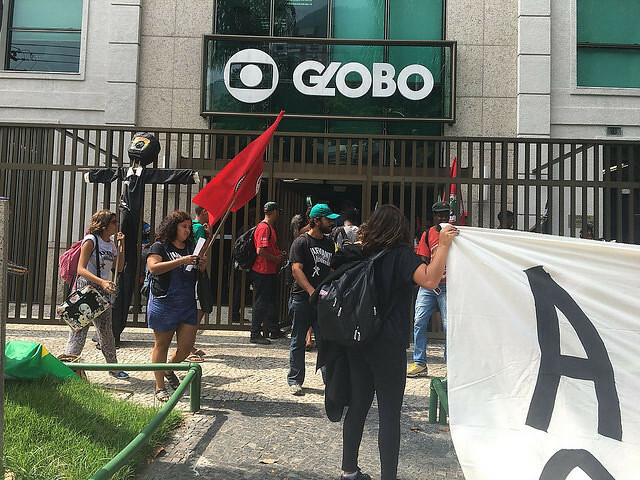 Demonstrations in support of former Brazilian President Luiz Inácio Lula da Silva are taking place outside the Globo media headquarters in Rio de Janeiro in the lead up to his appeal hearing on Wednesday. “We are carrying out this act to denounce the political misinformation campaign that is being carried out by the Globo Media Network. Historically, they have played a regrettable role in deciding the political fate of this country,” Paulo Henrique, a member of the Landless Workers' Movement (MST) stated. Globo, which is one of Brazil’s most powerful media conglomerates, has been repeatedly accused of forming a prejudicial alliance with members of the Car Wash task force to prosecute the former president. A recent study carried out by the Instituto Paraná Pesquisas, a market research firm, 42.7 percent of Brazilians agree that Lula is being persecuted by the media and the judiciary in an effort to remove him from the 2018 presidential race. The composition of media ownership in Brazil is extremely concentrated, belonging to a handful of four or five wealthy families. It has been documented that Estado de São Paulo, commonly referred to as Estadão, alongside O Globo, supported the military coup in 1964. “Historically, Globo played an active role in the coup of 1964. They also negatively influenced the outcome of the 1989 presidential elections, which lead to the loss of President Lula. On top of that, they also contributed to the congressional coup of former president Dilma Rousseff and now they misrepresent Lula,” Henrique added. Since 2016, he has been under investigation as part of the anticorruption campaign known as Operation Car Wash.
How is Brazil's economic crisis impacting young people?